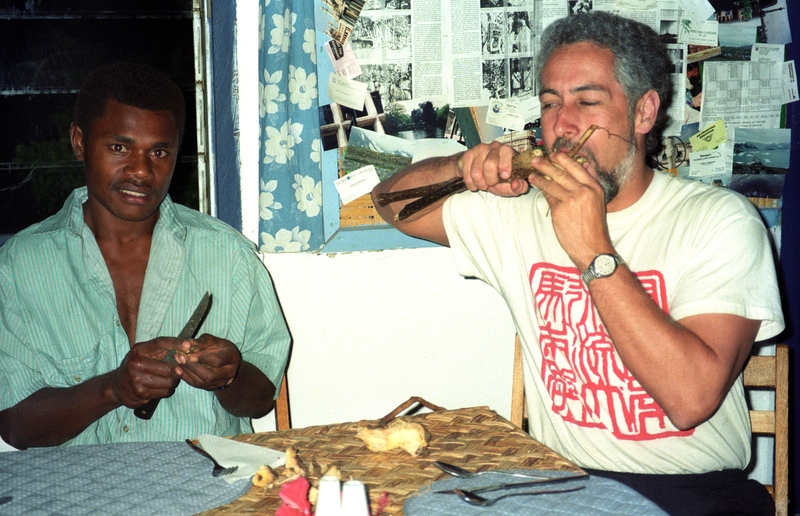 I had tried kava some years ago when I was in Fiji at a holiday resort. There was a bowl of what looked like (and tasted like) muddy tea. I had a cup of it, and did not notice anything much. So when Irene told me that the Vanuatu kava was much stronger, and the locals said that the kava in Fiji was more like dishwater, I decided I should try the local stuff while I was on Tanna. 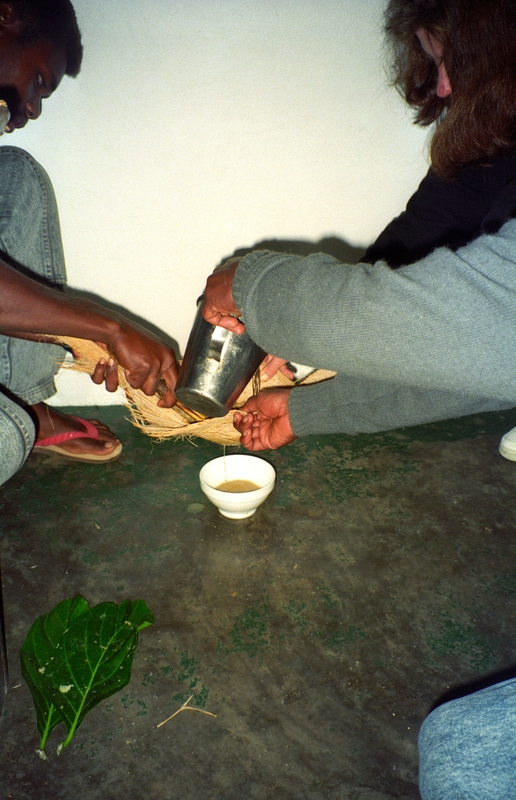 Kava is prepared and consumed in various ways across the Pacific islands. In some places, the root is ground by hand or pounded by hand, often in a stone bowl or using a piece of coral to do the grinding. The ground root is then added to cold water and drunk as soon as possible. 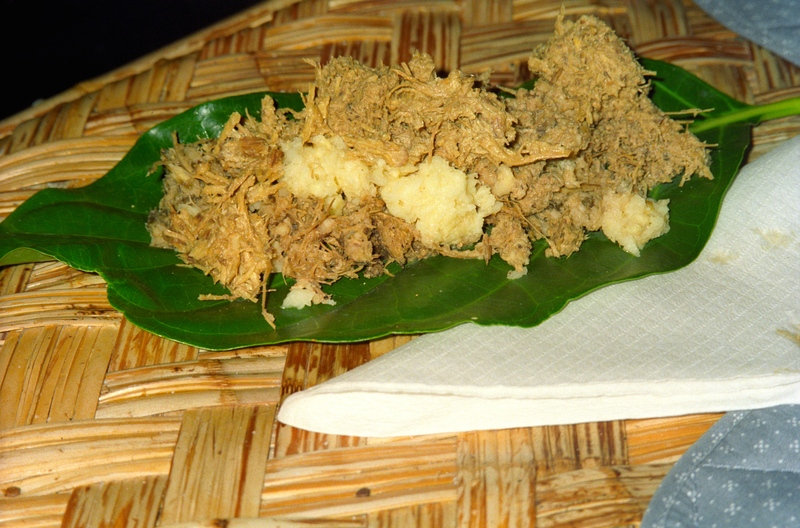 In the southern islands of Vanuatu, including Tanna, the root is chewed in the mouth and the resulting paste spat into a container. Chewing produces the strongest kava not only because the kava particles are finer, but also because enzymes in the saliva activate the psychoactive chemicals allowing them to be absorbed into the bloodstream faster. 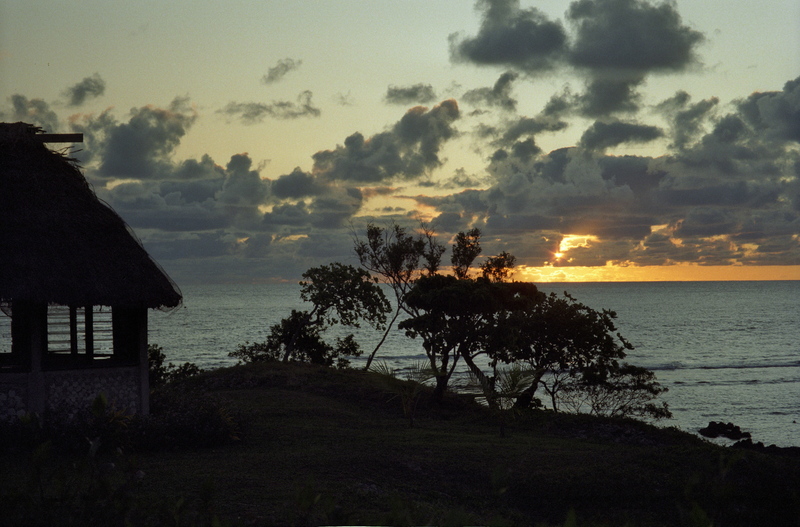 In Tanna and other southern islands, the chewing of kava is done for the older men by young boys, or according to one account, by the virgins of the village. So when I expressed interest in trying Tanna kava, Irene got some locals to come in the evening with kava root. They also brought a young boy to do the chewing of the root. They brought some kava root, which looked a little like ginger root, with a rough and dirty skin. But I was not all that wrapped in the idea of consuming a drink full of the saliva of a local boy, so told them that I would chew it myself. After washing the root, I cut some pieces and chewed them up. It tasted like chewing up muddy potatos, but with a more pungent taste and smell. Not long after I started chewing, my tongue and lips started to tingle and then rapidly went numb. I spat out the chewed up paste into a bowl, and worked my way through the rest of a fairly large piece of root. The numbing of the mouth is caused by two kavalactones kavain and dihydrokavain, which cause the contraction of the blood vessels in these areas, acting as a local topical anesthetic. According to Wikipedia, these anesthetics can also make one’s stomach feel numb and sometimes, this feeling is perceived as nausea. Once I had finished chewing the root, the older man then added water to the bowl and mixed the paste into it. I drank the resulting greenish-brown liquid fairly fast as kava is drunk down, not sipped slowly. It tasted like a mix of dirt and plant roots, and was quite muddy, in colour and taste. Kava supposedly produces mild euphoria and calmness, relaxed muscles and a sense of well-being. It has been likened to diazepam. I was about to have a somewhat stronger experience! My mouth was very numb, and I started to feel light-headed and euphoric. And then I started to “buzz” and to hear a sort of musical white noise. I went outside and lay down on the ground looking up at the stars in the sky. I felt incredibly relaxed and happy, almost euphoric. And the kava, or the universe, was singing to me. I must have spent an hour or more lying on the ground, entranced by the patterns of sound. It seemed to me these sounds were coming from everything around me, including the dark sky and stars above. The sounds were a little like a very musical white noise, or enhanced tinnitus, and I could hear patterns in the noise. It was very enjoyable and I was think I must have gone into a trance state listening to it. I was later told that strong kava will sing to you, or rather, that the universe sings to you. And the strong kava of Vanuatu is more likely to do this. In some parts of the Pacific, kava is used in religious ceremonies to commune with the gods and spirits. I started to feel quite nauseous after some time, I have no idea how long I spent listening to the universe outside Irene’s restaurant at Whitegrass. So I went to bed and slept soundly. I awoke the next day, still with some background kava music, and feeling quite nauseous. It felt somewhat like a bad hangover, but accompanied by musical tinnitus. The music and nausea persisted for several days, and I think I was still experiencing both for a while after I returned to Australia. Why did I have such a strong and long-lasting experience? According to many accounts of kava, its effects last only an hour or two, and there are no after-effects the next day. I think the answer is the combination of several factors. First, Tanna kava is extremely potent compared to that of other islands in the Pacific. Second, the method of preparation by chewing it results in stronger and more readily absorbed psychoactive ingredients. Third, I chewed it myself, so got an extra dose directly from the chewing, as evidenced by the extreme numbness of my lips and mouth. And finally, I think a drank a quite large cup full of it. After I wrote the above para, I took a look in Wikipedia and discovered that there are potent strains of kava known on Vanuatu as “Tudei” kava, That’s “two-day” kava because it is said to have effects lasting two days due to its chemical profile being high in the kavalactone dihydromethysticin. So perhaps I had an overdose of Tudei kava! I’m glad I tried it, and I will never forget the experience of the universe singing to me, but if I try Vanuatu kava again, I think I will be more cautious in how much I consume. This entry was posted in Altered States, Travel and tagged kava, nootropic, psychotropic, Tanna, Vanuatu by colinmathers. Bookmark the permalink.